Oregan might be the name behind almost every chainsaw bar/blade on the market, but just how well do they compete as far as producing a chainsaw in its entirety goes? Well not every chainsaw delivers on its promise of high performance and efficient power, but there are no such worries in this case, the Oregon 36v cordless electric self-sharpening chainsaw is set to make a reputable name for itself in the chainsaw market. With consistently high levels of performance and features to offer you an excellent cutting experience, this chainsaw is the ideal gardening and forestry tool for professionals and beginners alike. Despite having the force of a petrol-powered machine, the Oregon cordless chainsaw saves you from experiencing the stress of petrol chainsaws such as the expense of refuelling, and engine maintenance tasks. The best part is that it operates quietly and smoothly, as any outstanding chainsaw should do. This chainsaw features an automatic oiling system, and uses ever reliable lithium ion battery technology with high capacity power cells. When fully charged, this machine, which has a chain with a speed of 12 m/s, has the ability to make 250 cuts of wood measuring 5-7 cm in diameter, pretty impressive stuff. The battery packs can be interchanged to maximize on lasting performance enabling you to carry on getting the job done. The superior battery ensures that its performance remains constant from the start to the completion of the task. 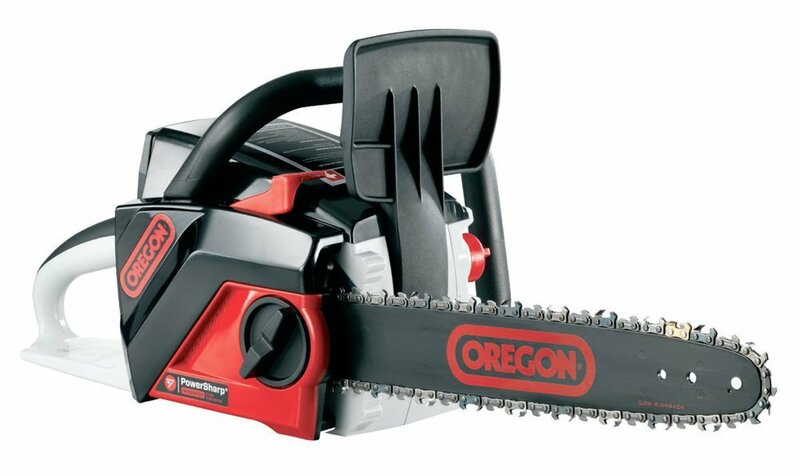 The Oregon 36v cordless chainsaw is compatible with any Oregon cordless tool system product, so you can always change batteries with those from other tools when the need arises. Being cordless naturally means that there are no cables to plug in or petrol to be refilled, this chainsaw is ready and can be started in a second. This chainsaw produces minimal sound when in use and is silent in between cuts which makes it a good tool to use in quiet environments. Though it operates with a power output to rival some petrol chainsaws, it does not pollute the environment with fumes making it a very eco-friendly machine. Quality really is a the heart of this chainsaw, for example, to ensure each cut is clean and accurate, Oregon have fitted a precision chain sharpening system which sharpens the chain within 3 to 5 seconds, extremely useful should you find the blade struggling to cut mid task. Its advanced design and detailed features are meant to offer optimum comfort and increased ease with each use. Indeed, it is the perfect tool for forestry and domestic applications.